LVDA and Electronic Visualization Laboratory please donors with reality visualization and collaboration systems using advanced engineering discoveries. LVDA is collaborating with the Electronic Visualization Laboratory (EVL) at the University of Illinois at Chicago to provide stakeholder engagement and fundraising opportunities for a potential new Engineering Building. LVDA provided the EVL with a walk-through animation of the proposed new building for programming and incorporation into EVL’s Unity 3D cityscape in CAVE2. 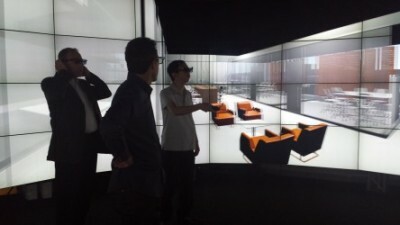 Developed by the EVL, CAVE2 is a room with a high-resolution 3D video and audio environment where graphics are projected in stereo onto three walls and the floor. People can view the projection with active stereo glasses equipped with a location sensor. When LVDA and EVL finalize the model, College of Engineering stakeholders and donors can view the correct perspective in real time as they move within the display boundaries to achieve a fully immersive experience both in and out of the building. It is fitting that the mission of both the EVL and the Engineering Building itself is to enable interdisciplinary scientific and engineering discoveries by designing and developing high-performance visual and collaborative systems using advanced networking infrastructure.